The conference runs two days with approximately 200 hundred people attending each day, and will feature 20-minute plenaries and 90-minute workshops from the Bioneers community, as well as, our own students and community members on work that they are passionate about in relation to social and environmental issues (see schedule below). 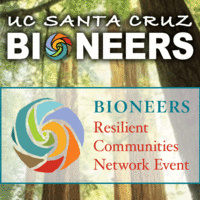 Visit the UCSC Bioneers Facebook Page for updates, and please share the event with friends and colleagues. This year we will have conference tracks running throughout the program. They are a fusion of themes from both Bioneers and UC Santa Cruz. This is still in development, though here is our current list to give you a sense: Eco-nomics; Ecological Design; Ecological Literacy; Ecological Medicine; Every Women's Leadership; Indigenous Knowledge; Justice: Racial, LGBT, Human Rights, Equity, and Rights of Nature; Media; Nature, Culture, Spirit; Resilient Communities; Restorative Food Systems; Restoring the Bio-Sphere; and Youth Leadership. We may add a Pre/Post Conference Intensive if there is capacity and interest.